We had another 3-storey blinds project in RCBC Tower, Makati City but this time our client requires that the front panel facing outside is a white satin (non-glossy) venetian blinds while the inner part is sunscreen roller shades. There is a reason for this setup i.e. the building administrator only allows white window cover to maintain a consistent color appearance of the building from the outside. 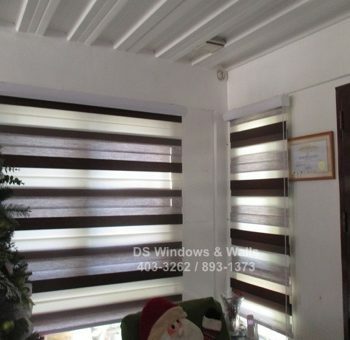 They also disallow glossy metallic blinds that could cause a lot of sunlight reflection and glare. 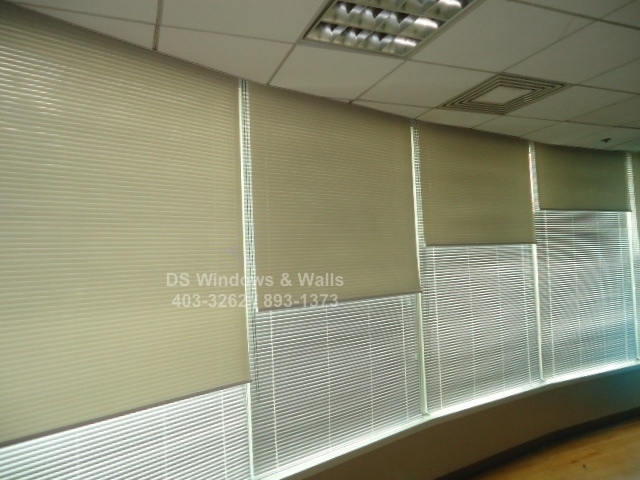 However, our client preferred to overlay the white venetian blinds with roller shades so that they can further control the sunlight and at the same time have the freedom to choose the color of the fabric from within their office. Since the outer blinds is already compliant with the building rules, they chose a more playful fabric color to some of their rooms e.g. yellow, blue, khaki, etc. This project is a bit challenging because this includes dismantling and disposal of their existing window blinds that’s already aging, old, and dirty. 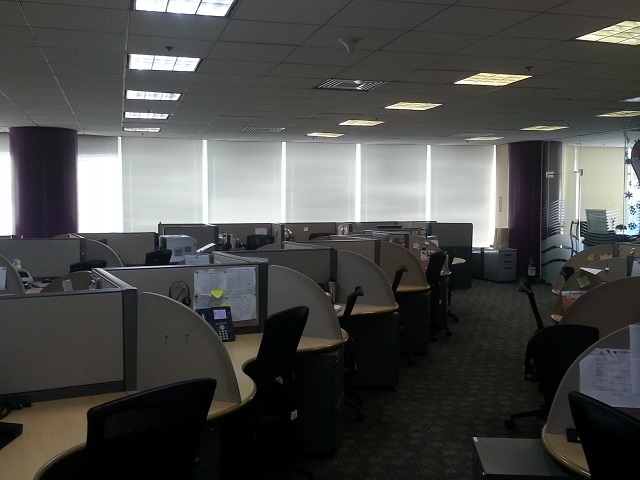 Since this client is a back-office of a multi-national company, they work 24×7 and we are only limited during the weekends to install their window blinds. Some rooms especially the call center area requires timing of drilling since we cannot afford to make drilling noise while some of their agents are engaged. 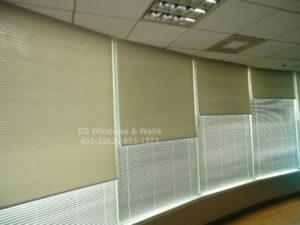 Our client preferred the Khaki color for the management and executive rooms, yellow shades for pantry and entertainment rooms, beige colors for work area, and gray for most utility rooms. 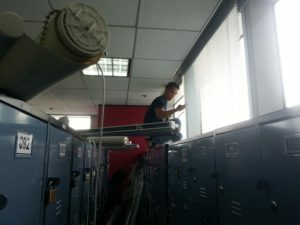 During the installation we also gave instructions to key persons on how to use and properly care for their window blinds. 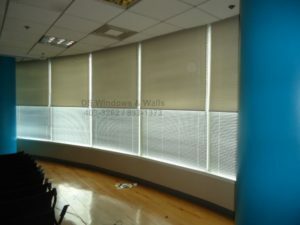 A very common mistake for companies availing blinds as their window cover, especially the venetian blinds, is not giving proper instructions to their employees on how to use and maintain it that causes premature aging of the blinds like accidentally leaning on it and improper cleaning procedures that over-bends the slats. In between weekends, when starting a new installation session we sometimes find a few newly installed blinds bent or askew where we later found out due to careless use. 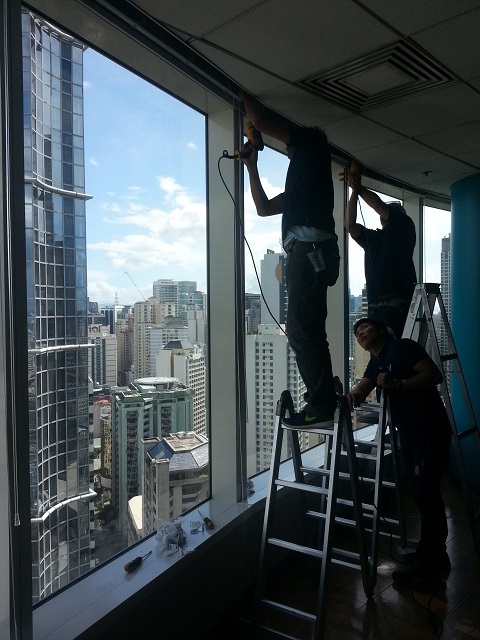 The last two photos are our blinds specialist team in action, working on the weekends dismantling the old blinds and shades and installing the new ones. Our blinds installers, having been doing this for several years, are technical experts in the industry and is always committed in their craftsmanship. 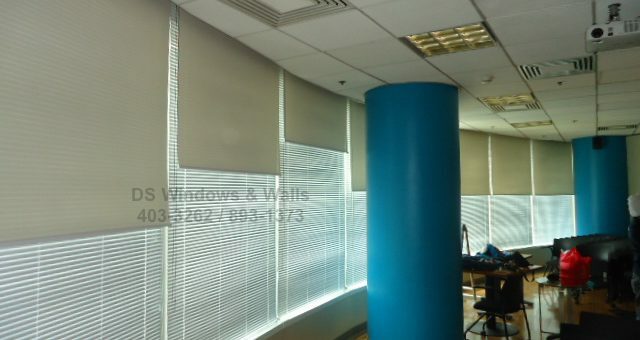 For your residential and corporate window blinds and shades need, call us at (02) 403-3262, (02) 893-1373, (02) 668-9668, or 0916-311-3909. You may also visit us at our mall branches at 4th floor Waltermart Makati, 3rd floor Robinsons Metro East Pasig, 2nd Floor Pacific Mall. 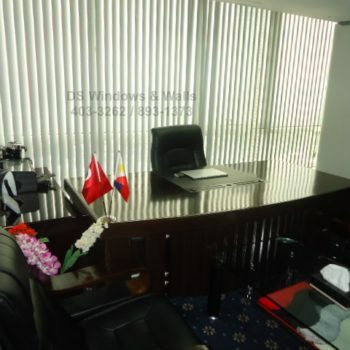 You may also email us at inquiry@dswindows.com.